In the 1960s baby aquatic turtles called hatchlings were all the rage. You could order them from catalogs and mail order, where they were packed in small turtle boxes, which often had advertising or other sales schtick on them. Parents felt like turtle owning was a good way to teach responsibility. Soon five-and-dime stores (also called variety stores) had them in the pet department. The most popular type were red eared sliders and they only cost a quarter to fifty cents. Children were encouraged to bring their turtles to the classroom, which often had a tank set-up for visitors. Eventually you could find a cartoon-type ad for a turtle kit—complete with a kitschy dish, water bowl and food, sometimes even with a plastic palm tree or lawn chair in the setting. Other companies promised they would paint your name on the turtle’s shell. Unfortunately, the dish was both limiting and unable to be heated properly. And the food was inappropriately provided for. While the advertising was intense, there were no instructions on care and feeding and thousands died and wound up in the garbage. Turtles are pretty cool. They are reptiles and when you look at them you can imagine they came from the dinosaur era because they did! Over 200 million years ago. Their faces are similar to other reptiles and some have red eyes. Box turtle’s feet are webbed with pointy fingerlike toes. They breathe with lungs not gills, have backbones and scales on their skin. They are also cold-blooded like snakes so they need the sun to stay warm. Turtles will always have a home because they carry it on their back—the top part is a carapace and the bottom, the plastron. When they sense danger, turtles can pull its head and front legs into the front of the shell and tail and back legs—well, to the back; and the plastron bends at an area called the hinge and once closed, it is almost impossible to pry it open. This gives the impression that the turtle is in a box, hence the name. Not all turtles are alike. Turtles have developed special adaptations to live in specific environments. Some turtles live in freshwater such as ponds, lakes, or streams so consequently they have claws and webbed toes on their feet. The claws help them climb onto muddy banks and manipulate tree branches floating in the water. And then there are the land-owning variety. Tortoises or terrestrial turtles live on land and their hind legs are shaped like an elephant’s, whereas box turtles often live alone in woods, fields and swampy areas, some swim. Box turtles are only partially aquatic, spending the majority of their time burrowing in the mud or hiding beneath a rock which means they spend most of their time on land in prairies, savannas, and steppes. These turtles have developed clubbed feet for walking in rough terrains and yield domed shells with hinged plastrons. 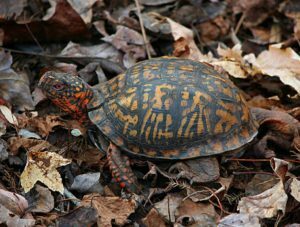 The first thing to understand is that box turtles have a profoundly strong connection to the location they are born in. They rarely travel far from where they were hatched. Once they form a connection to these surroundings, they stay there for the duration of their life. Marine turtles have adapted to life in the sea or ocean and sea turtles are generally solitary creatures that remain submerged for much of the time, so they have evolved large, flat paddle-like flippers instead of legs—fast in the water but slow on land. Since sea turtles cannot hide in their shells, they use speed to protect themselves against predators such as sharks. Some species of sea turtles can weigh over 1,500 pounds! There was a mystery, specifically about female loggerhead sea turtles, for more than 50 years. Natal homing is a pattern of behavior in which animals migrate away from their geographic area of origin and then return to reproduce in the same location where they began life. Scientists knew that female sea turtles swam thousands of miles and returned to their birthplace to lay their own eggs yet were stymied about how it was done. After a sea turtle is hatched out of their shell onto the beach—if they can make it to the water avoiding predators, birds and crabs—they will not show up again for years. The loggerhead, a favorite of scientists, is born small enough to fit into one’s palm, but by the time they return to the coast they are about a foot-and-a-half long (45 centimeters). The question was: where are they and how do they know how to return to within 40 miles of home to lay eggs? Previous studies showed that sea turtles use Earth’s magnetic field to help guide them at sea, but it was unclear whether magnetic features also help steer them toward the nesting sites chosen by their mothers. Also, it is known that earth’s magnetic field not only protects the planet from dangerous solar radiation—like a big invisible shield—but it changes over time because there are fluctuations in earth’s iron core and the molten metal that surrounds it. Then the question occurred as to whether the loggerheads were influenced by earth’s changing magnetic field? 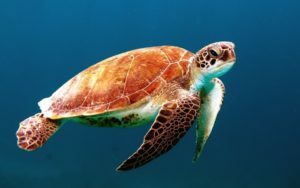 “Our results provide the strongest evidence to date that sea turtles find their nesting areas at least in part by navigating to unique magnetic signatures along the coast," the researchers wrote in the study for the journal Current Biology. Scientists are unsure how turtles detect the geomagnetic field, but it’s possible that tiny magnetic particles in their brains help the turtles process unique signatures. “The only way a female turtle can be sure that she is nesting in a place favorable for egg development is to nest on the same beach where she hatched,” scientist J. Roger Brothers said. “The logic of sea turtles seems to be that ‘If it worked for me, it should work for my offspring.’"
Blomquist, Christopher. Box Turtles. New York: The Rosen Publishing Group, 2004. Book. Stone, Lynn M. Box Turtles: Weird Pets. Vero Beach, FL: Rourke Publishing LLC., 2002. Brothers, J. Roger and Kenneth J. Lohmann. Current Biology: “Evidence for Geomagnetic Imprinting and Magnetic Navigation in the Natal Homing of Sea Turtles". FDA: “Pet Turtles: A Source of Germs"
Geggle, Laura. Live Science. “Sea Turtles Use Earth’s Magnetic Field to Find Home"
Pappas, Stephanie. Live Science, “Baby Sea Turtles Go Rogue, Satellite Shows"